Gammarus pulex, or the ‘river shrimp’, is a crustacean related to the crabs and lobsters. It is similar to the ‘sand-hoppers’ commonly seen on our beaches. G. pulex generally lie on their sides under stones, rocks, leaves and wood on river and lake bottoms. They also swim on their sides and can crawl over surfaces and into crevices. In the 1950s, fishermen thought it would be a good idea to bring some from England and introduce them to rivers in Northern Ireland, as they thought that fish (trout and salmon) might like to eat them and grow faster. Adult males reach nearly 2cm in length, females are smaller and the young are miniature versions of the adults. They have two pairs of antennae on their head, five pairs of walking legs and two other pairs of leg-like limbs that have hooks on the end. They have been described as looking like a ‘swimming comma’. Males can often be found carrying their mates, and protect them aggressively. The Northern Ireland populations are all deliberate introductions from England. Gammarus pulex is common in Great Britain and western Europe and is now widespread in Northern Ireland; it is still spreading here and has invaded the Republic of Ireland. The major start of the invasion was introductions of G. pulex into rivers west of Lough Neagh, such as the River Ballinderry. From there, it has now spread to nearly all major rivers and many lakes. For example, the River Lagan and its tributaries, and Loughs Neagh and Erne, all have large G. pulex populations. G. pulex is also now found in the Republic of Ireland, such as the River Boyne and rivers around Dublin. It is likely these originate from Northern Ireland populations. Studies show the species can live in nearly all freshwater habitats in Ireland, but it might not invade very high altitude streams where the native shrimp, Gammarus duebeni celticus, still dominates. The life cycle of Gammarus pulex is complex. Males grab and hold females before deciding which one is likely to produce lots of eggs. Then the male carries his chosen female for several weeks until she sheds her skin and the male can mate with her. He then lets her go and she carries the developing young in a brooding pouch. After about a month, the young shrimps swim out of the brood pouch, and a few months later they can breed themselves. As females can produce up to 50 young each month, the population soon grows. Because Gammarus pulex can breed so fast, and it likes to eat other creatures living in rivers and lakes, those creatures may disappear or become rare. 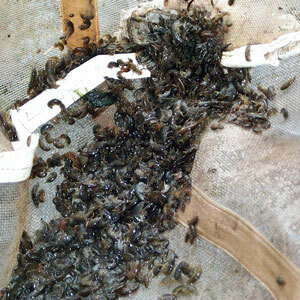 For example, by eating our native mayflies, these are now becoming scarce in some rivers. This means that our native communities of organisms are becoming less diverse and this might have effects on bigger creatures, such as fish and even us. For example, fish might have less choice in what to eat, and the animals that clean up our water may not be there anymore, and we need clean water for our houses and businesses. These shrimps can also carry diseases and parasites. For example, fish and ducks can become infected with nasty gut-worms if they eat infected shrimps. It is also now known that Gammarus pulex is driving our native river shrimp, Gammarus duebeni celticus, to near extinction. This is because the invader attacks, kills and eats the females of the native shrimp. Our native is able to do the same to invader females, but to a much lesser degree. This is because the male invaders are much more aggressive in both attacking the native females and defending their own females. Thus, native females disappear faster than invader females, and this results in the rapid loss of the native population. Gammarus pulex can spread to new rivers and lakes in many ways. It can travel along canals, hitch a ride on boats and even travel on the feet of birds, such as ducks. If fish are moved from one area to another, young shrimps can travel in the water with them. In the past, ecologists and fishermen deliberately moved them around (for example, to the Isle of Man), but this is now illegal. If you find animals like these shrimps in a river or lake, don’t panic. The native shrimp looks quite like the invader, but the native does not do as much harm. It would be useful, however, to send some specimens to the person below and have them properly identified. We can then record this and use the information to map the spread of the invader and also find areas where the native still lives. any action people can take to decrease likelihood of introduction or spread of a species e.g. not buying or planting it, proper disposal, cleaning of equipment etc. disturbance, use of any potentially environmentally damaging methods or methods that may pose a health and safety risk should not be encouraged. Ensure any health and safety issues are addressed. Fishermen and fish-farmers should avoid spreading this animal by making sure they are not transported with bait or live fish. advice to groups that may encounter, deal with or potentially spread these species e.g. garden centres, anglers, boat clubs etc. Unfortunately, there is little likelihood that we could control this species. if discussing use of chemical control make sure to mention that many of these are regulated and may need qualified people to apply them. The text must clearly inform people of appropriate methods and ensure mention of biological control and use of chemicals does not encourage inappropriate use. There is no management of this species. There are several places to look for more information. The QUERCUS Biodiversity and Conservation Biology Centre at Queen’s University Belfast has research projects on this invader Also, there are scientific articles that go into a lot of details about this invader and its impacts. The author, a lecturer at Queen’s University of Belfast, has been studying Gammarus pulex for nearly 20 years.